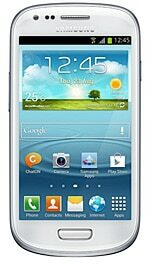 The Samsung Galaxy S III Mini is a smaller, less powerful version of the Korean phone maker’s flagship Galaxy S III handset. The S III Mini features a 4-inch 800 by 400 pixel display, along with a 1GHz dual core processor and a 5MP camera that shoots 720p video. The new device will ship with Android 4.1 “Jelly Bean” and includes Samsung’s proprietary S-Beam sharing technology, which uses NFC to initiate connections with other S-Beam devices, and also offers Wifi, GPS, FM radio and Bluetooth 4.0 LE connectivity. The S III Mini was announced in Frankfurt, Germany on 11 October 2012 and became available in early November. The device retails from around £260 (US$415) SIM-free. An LTE version of the device is available in the US as the Samsung Galaxy Axiom on the US Cellular network, where it comes pre-loaded with Google Wallet. Our UK retail model does not support NFC. Nor do any of the other European territories (Sweden, Norway, Germany, Belgium, etc.) where it is currently available. We’ve asked Samsung for clarification on which territories will get the advertised NFC, but for now it’s worth checking your local Samsung site just in case. Hat tip to reader testing2ohn. Update An NFC version of the Galaxy S III Mini will be available in the UK from the end of January 2013, and is expected to be available in other markets as well. Thanks for the tip. It’s a shame that this keeps happening; I mean cameras and Bluetooth aren’t market-specific features, so why do this with NFC? Anyway, I’ve updated the article above.